Crystallins, the major eye lens proteins, were investigated after preceding irradiation with X-rays or UV light by using analytical ultracentrifugation and other physicochemical and analytical techniques. Sedimentation velocity and sedimentation equilibrium runs of unirradiated and irradiated samples of the crude extract and individual fractions of calf-lens crystallins (α, β H, β L, γ) were performed under varying experimental conditions. While by the impact of radiation sedimentation coefficients remain essentially unchanged, high-speed sedimentation equilibrium experiments revealed significant changes of the molar masses of the respective crystallin species, depending on the crystallin class and the nature of the radiation used. The γ-crystallins turned out to be the most stable species against radiation-induced damages. UV absorption and fluorescence spectroscopy, size-exclusion chromatography, SDS electrophoresis, viscometry, and the analysis of SH and SS contents provided useful complementary information. In conclusion, several radiation damages could be registered: aggregation, crosslinking, dissociation, fragmentation, destruction of aromatic amino acids, cysteines and cystines. 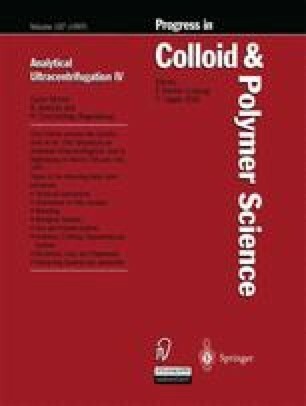 The OH scavenger formate and the chaperone α-crystallin turned out to protect the crystallin crude extract to some extent against X-ray-induced aggregation phenomena.